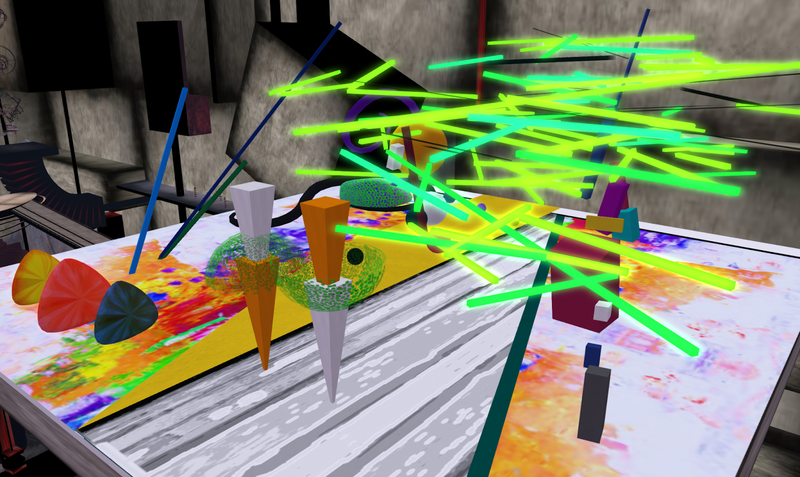 Opening today, Sunday, April 27, at 1 pm slt, is an extraordinary collaborative exhibition, The Golden Age of the Russian Avant-Garde, showcasing the collective creativity of artists Alpha Auer, Bryn Oh, Caer Balogh, Euaplinos Ugajin, Jo Ellsmere, Nessuno Myoo and Soror Nishi. 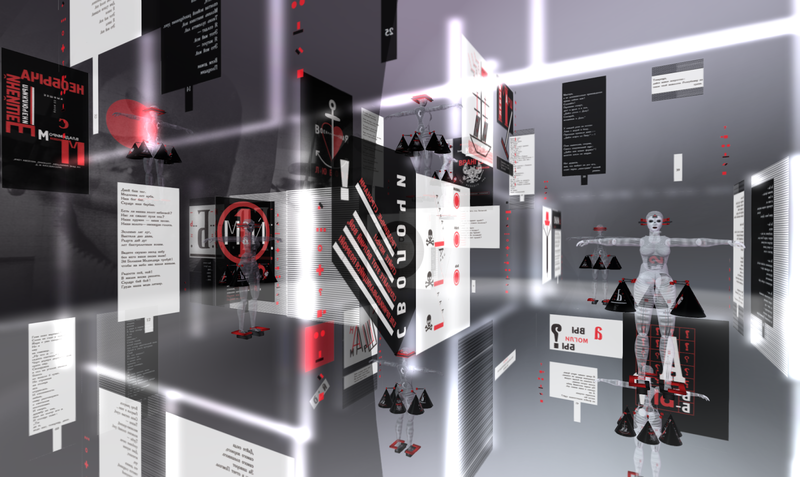 The installation is a companion to an enormous presentation in real life now open at Moscow's Manege Museum, curated by Saskia Boddeke (known as Rose Borchovski in Second Life) and filmmaker Peter Greenaway. The exhibition in Moscow includes more than one thousand artworks, an extraordinarily colossal undertaking spread across 5,000 square meters. (In the museum world an exhibition on this scale is exceptional.) "It will include polyscreen installations made with the help of the most up-to-date projection, light and sound equipment. It will represent a new approach to the history of art, combining film and painting, animation and 3D virtual world technology helping to create a unified atmospheric work, drawing the viewer into the space of Russian avant-garde," the curators inform. The video above by Greenaway provides some context to the curatorial orientation. The Russian avant garde examined by the exhibition spans the turbulent years 1910 through 1930, propelled by the upcoming centenary of the pivotal year 1917. Rarely has human history witnessed such a violent upheaval in politics, economics, and in every aspect of society as during those twenty years — the old rejected for the new with impassioned and idealistic hopes of building a new civilization. For Russia's artists it was a time of experimentation, of bold new ways of thinking, and a deluge of creativity — and many of them, swept up in the swirl, collectively envisioned themselves as a key element in societal revolution — and in all genres, ranging from visual art, to film, to architecture, to music, to dance, to graphic design and other areas. Many of these artists — the "Constructivists" as they became known — flourished until the ascendency of Stalin after Lenin's death in 1924. 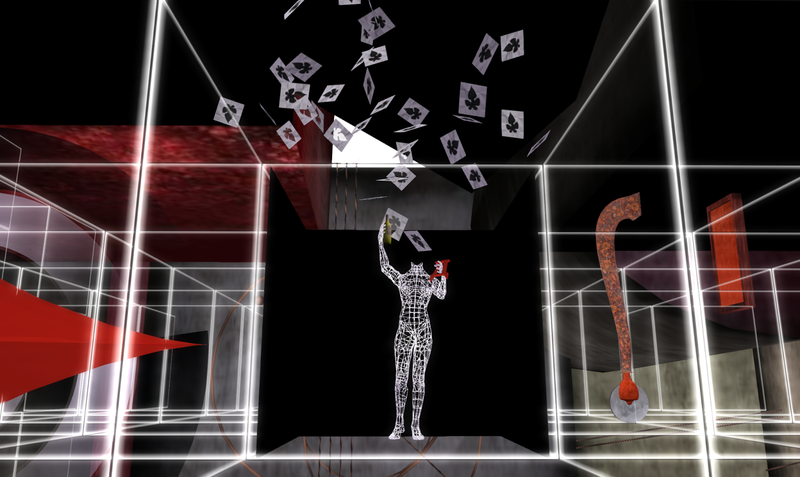 For the companion exhibition in Second Life, Saskia/Rose invited the aforementioned group of artists create an installation, and asked Bryn Oh to serve as the organizer. Although Caer Balogh isn't credited as a builder on any particular piece, she's an extraordinary scripter who contributed broadly — you'll see her work in play as you first walk into the large installation area and witness a large black box fly to pieces, only to slowly reassemble. Bryn constructed the overall space, which is formidable and which conveys the fervor of the period through its sheer monumentality, and she herself created a re-interpretation of Tatlin's Tower (image immediately above), or, as Bryn's notes indicate, "the project for the Monument to the Third International (1919–20) ... a design for a grand monumental building by the Russian artist and architect Vladimir Tatlin, that was never built. It was planned to be erected in Petrograd (now St. Petersburg) after the Bolshevik Revolution of 1917, as the headquarters and monument of the Comintern (the third international)." Artist Alpha Auer, best know for her alpha.tribe series of avatars, has interpreted El Lissitzky's costumes for Victory Under the Sun, a "suprematist" ballet choreographed by Nina Kogan, a remake of a 1913 Futurist opera, Victory Over the Sun, by Mikhail Matyushin and Aleksei Kruchenykh. (The Futurists, and the original Dada group, active during this same time period, also saw themselves as agents of social change.) You can acquire all of Alpha's avatars near the landing point: Announcer, Globetrotter, Gravedigger (in three versions), New Man, Old Man, Postman, Troublemaker and Mayakovsky. The avatars are also available on the ground level of the larger installation. 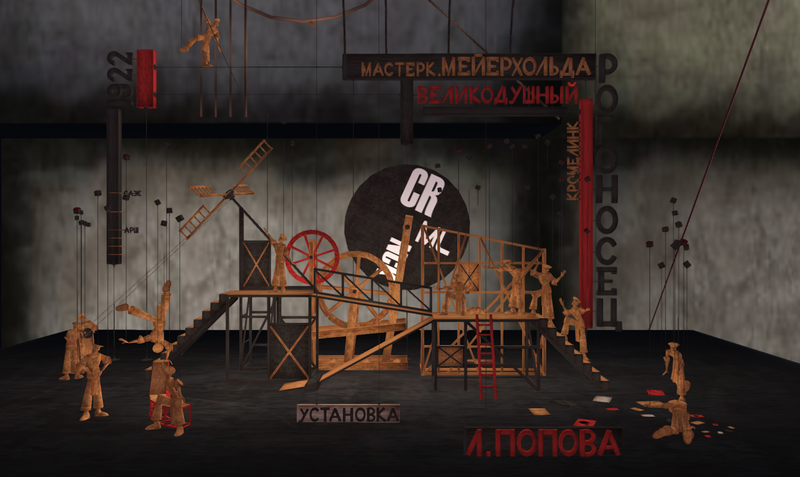 Nessyno Myoo has investigated the world of theatre in his replica of the set, originally designed by Lubov Popova, for Vsevolod Meyerhold's production of Fernand Crommelynck's The Magnanimous Cuckold in 1922. (Here I began to appreciate my basic knowledge of Russian: the word установка (pronounced ustanovka) simply means installation; other text you'll see include the names of Meyerhold and Popova.) To get a glimpse of some archival images of this remarkable set, visit here. 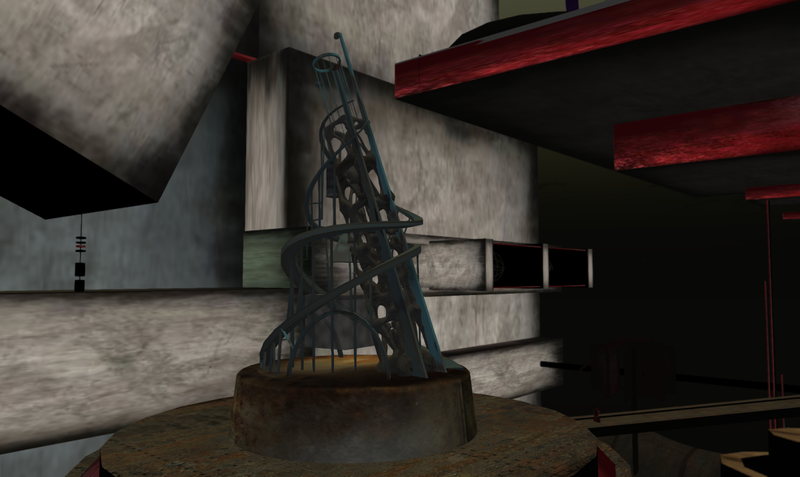 Nessyno has also re-created several sculptures by Alexander Rodchenko, and they're located fairly close to the stage. If you ascend the nearby staircase, which twists and turns to high height, you'll be on level for a good view. They're partly visible to the left in the image immediately above. It's Jo Ellsmere who steals the show. Still images cannot begin to convey what she has created, and even the brief video above will only provide a glimpse. By carefully scripting five avatars in elegant synchronized movement, she has not only explored biomechanics — a system of actor training introduced in the early 1920s by Russian actor, director and teacher, Vsevolod Meyerhold — she has created a stunning display of technical virtuosity with profound implications for dance, performance art and choreography in virtual spaces. Her human forms are at times one — although the overlapping textures remind us of the multiplicity within — and then unfold into five forms, whether slowly rippling apart or simply diverging, with breathtaking attention to detail and timing. While I have seen similar works by Jo in the past, they seem mere studies in comparison to this newer work, which alone is worth repeated visits. 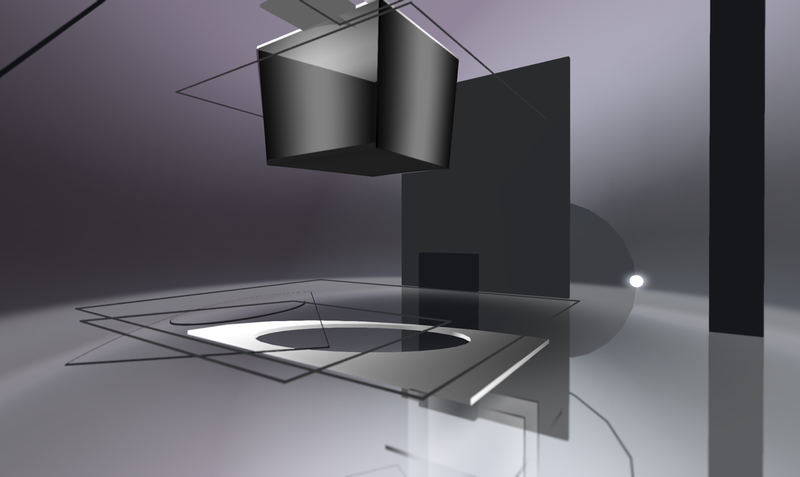 Alpha Auer has also considered the work of El Lissitzky, taking one of his two-dimensional works and transforming it into a three-dimensional space. Lissitsky, who was later a major influence on the Bauhuas, created a series of abstract geometric paintings he called "prouns" (pronounced pro-oons), and it's number 18 that Alpha has exploded for the installation. Alpha has additionally re-interpreted a collaborative work between El Lissitzky and Vladimir Mayakovsky, a concrete poetry work from 1923 entitled For the Voice. To see a few pages of the originals, visit WikiPaintings here. No doubt some working knowledge of Russian might help the visitor, but immersion in the graphic design is a visual delight. Artist Soror Nishi has created a display inspired by Wassily Kandinsky, employing colorful basic shapes and lines, with hints of her famous tree canopies. Lastly, Eupalinos Ugajin has created an installation on the uppermost level based on the book We by Yevgeny Zamiatine, sometimes cited as an inspiration for George Orwell's novel 1984 and Aldous Huxley's novel Brave New World. As you explore all these works, be sure to have local sounds turned up, and keep an eye out for small microphones, which emit audio excerpts from the period. The region's preferred windlight setting is [NB] Sepia 0000, and for Jo Ellsmere's work in particular it's best to have advanced lighting and shadows turned on. Throughout the build, you'll also spot a few other little installations, so take your time — this is a large area that will benefit from repeat visits. And if you happen to be in Moscow, you can enjoy the SL exhibition on one of four interactive viewing stations in the Manege Museum. Thank you, Eupa and Elif!